There are 4 posts tagged diy (this is page 1 of 1). Mostly I’ve been blogging about my adventures in Linux-land. But I wanted to write a bit about my other project. About 9 1/2 years ago, we got an iMac, and about four years ago we replaced it with a Mac Mini. The iMac was a mid-2007 20″ model. (This was the first Aluminum and Glass version, replacing the earlier white plastic models. You can watch Steve Jobs introduce the Aluminum Series on YouTube.) The specs were: 2.0 GHz Core 2 Duo, 250 GB SATA, SuperDrive, and 1 GB of DDR2. It cost $1,220. The late 2012 Mac Mini that replaced it had a 2.5GHz Core i5, 500 MB SATA/5400, 8 GB DDR3) and cost $669, but we had to buy a monitor for it (a Samsung S23C570, which probably cost around $200). So the Mac Mini was definitely an upgrade. But that wasn’t why we upgraded. 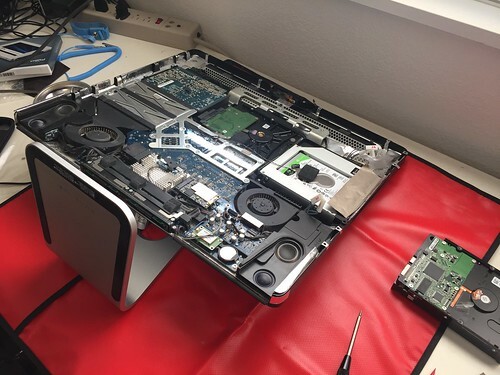 It was because the iMac was barely working. The hard drive would go “tick tick tick” for the first hour or two whenever you started running it. The SuperDrive had quit working a couple of years earlier. (Technically, a DVD got stuck in it and could not be removed.) Plus the usual “I’m an old Mac so sometimes I just take forever to do things” that we’re all used to. We finally upgraded because we couldn’t trust that it would work any more. So. Fast forward four years. I got tired of tripping over the iMac, but I couldn’t bear the thought of losing such a pretty computer. So …I fixed it. Or maybe I threw good money after bad and wasted my time fixing a ten-year old computer. Or both. I watched a ton of how-to videos (this one was particularly helpful) and read the instructions over and over again. Oh, and before I did that, I got a set of tools from iFixit and parts from OWC (MacSales). Then, after putting it off all during Lent, I ran out of excuses after Easter. So I spent last Friday replacing the original 250 GB hard drive with a 2 GB drive and the SuperDrive with a 2.5″ 1 GB drive. Here’s what it looks like on the inside with the new drives. See more pictures of the work in progress on Flickr. I will say that Apple sure doesn’t want you to make a bootable OS install disk. In spite of all the instructions they provide (here, here, and here). I own three Macs, but ((Shift+) Option+) Command+R doesn’t work on any of them. I finally dug up an old Snow Leopard install DVD and then upgraded to El Cap the slow and painful way. It’s time to upgrade your Ubuntu machines. 8 things to do after installing Ubuntu 15.04. One of the items is to add a tweak tool, which reminded me of Unsettings. I’m working on a similar list for Windows, except (a) nobody gets to install Windows, you have to buy a PC with it preinstalled, and (b) there are about 300 things you have to do next. Speaking of Ubuntu…. I barely know what a .deb is, so this article was complete gibberish to me, with all this talk about Snaps and Snappy for future releases of Ubuntu. Bjarne Stroustrup outlines changes in store for C++ in v17. I can barely remember how awesome I used to think C++ was back in 1986. And compared to C, I guess is was, then. Today—forget about it. Just give me a scripting language. I once had a coworker who bought into the whole green locavore zero-impact reduce-reuse-recycle mentality. Don’t use the city sewer if you can recycle your gray water in a koi point. That kind of thing. Half-a-century of tax cuts focused on the wealthiest Americans leave us with third-rate public services, leading the wealthy to develop inefficient private workarounds. In the case of electricity, we’re all in this together. But in the case of the sewer or garbage or whatever, then why worry about economies of scale and everyone pitching in together? Whatever. These people are as incoherent as they are misguided. Kudus: Instapundit, whose article is a sort of round-up of reaction around the web.